Woodmore bus driver Johnthony Walker walks back to his seat after giving a statement during his sentencing hearing in Judge Don Poole's courtroom at the Chattanooga-Hamilton County Courts Building on Tuesday, April 24, 2018, in Chattanooga, Tenn. Walker was convicted in February of criminally negligent homicide and a host of lesser charges, and he was sentenced Tuesday to four years in prison. This story was updated April 24, 2018, at 11:59 p.m. with more information. POLL: Do you agree with Johnthony Walker's sentence? Four years from now, Zyaira Mateen would have been in middle school, one step closer to her dream of becoming a doctor. Zyanna Harris would have been old enough to get a driver's license. Zoie Nash likely would have been pitching for a high-school softball team. And Cordayja Jones, D'Myunn Brown and Keonte Wilson would have each been on their own paths to one of a million possible futures. Instead, four years from now, if not sooner, Johnthony Walker will leave a prison cell after serving time for causing the accident that killed the six children. Judge Don Poole gave Walker a four-year sentence for his reckless aggravated assault charges and explained Tuesday to a room full of grieving parents that Tennessee law prevented him from handing down any harsher punishment. Poole said Walker didn't meet the qualifications of a "dangerous offender" that would have allowed him to stack Walker's numerous driving-related convictions together for a stiffer sentence. How did the judge arrive at Walker’s sentence? After a trial in February, an out-of-town jury found Walker guilty of 11 counts of reckless aggravated assault, six counts of criminally negligent homicide, six counts of assault, and one count each of reckless driving, reckless endangerment and use of a portable device by a school bus driver. Some of those were lesser charges than what Walker initially faced. When he was indicted in 2017, Walker faced six counts of vehicular homicide for each of the Woodmore Elementary students killed in the crash. Jurors, though, often have the option to find defendants guilty of a lesser charge, and that’s what happened in Walker’s trial. The jury said he was guilty of criminally negligent homicide instead of vehicular homicide. That means he went from a Class C felony that carries more potential prison time to a Class E felony, which carries less. Guilty verdicts are never the final step in the punishment process. Unless you’re found guilty of first-degree murder, which carries an automatic life sentence, a judge must determine your punishment, and how you’ll serve it. In Tennessee, a judge has two sentencing options when a defendant faces multiple charges: Concurrent versus consecutive. A concurrent sentence means that all sentences run together. It’s considered the lighter of the two options since a defendant often only serves time for their most severe charge. If one is convicted of first-degree murder and aggravated assault, for example, a judge will likely make a defendant serve the aggravated assault concurrently. Why? Because the defendant is already serving a life sentence for murder. Consecutive sentencing involves a judge stacking all of a defendant’s charges together and making him or her serve time for each count of the charge. But a defendant has to meet certain criteria first. According to Tennessee law, a defendant must be a professional criminal; violate probation; be a dangerous, mentally abnormal person; or be convicted of a statutory offense that involves sexual abuse of a minor, among other criteria, for a judge to impose consecutive sentencing. Even though Walker faced several charges, he didn’t meet those criteria or have a prior criminal history in Hamilton County, his attorney argued. As a result, Judge Poole sentenced him concurrently. He started with Walker’s most severe charge: Reckless aggravated assault, a Class D felony that carries two to four years in prison. He gave Walker the four-year maximum and ran everything else behind that charge. Walker spent almost a year in Hamilton County Jail before he made bond in fall 2017; he will receive credit for that time served. Because he is considered a “range one” offender, he will be eligible for parole after he serves about 30 percent of his four-year sentence. Poole did reject Walker's request for an alternative sentence, saying the Nov. 21, 2016, crash that killed six Woodmore Elementary School students and disfigured and traumatized 31 others was too horrific. Though Walker's defense attorney said she respected the court's decision, she said she plans to keep pushing for an alternative sentence. In the meantime, she said, Walker gave a heartfelt apology for his actions. 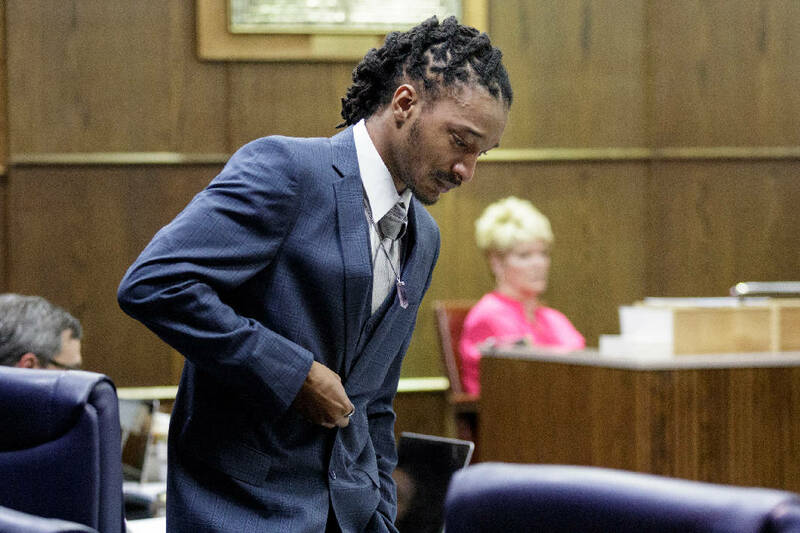 "I know the families will never be able to have the graduations, the play times, the laughter in the morning, being woken up on the weekend by their children to go to the park, or fix them cereal and toys," Walker said, choking up in court. "I just want to apologize for taking the lights out of y'all's lives." No one who testified Tuesday said the 25-year-old father was a bad man. Walker worked two jobs at the time of the Talley Road crash, had no prior criminal history and could be rehabilitated. The more complicated question was, could he be forgiven? "I just want you to know, Johnthony, that you took something from me, and that was all I had," said Diamond Brown, whose son, D'Myunn, 6, died in the crash. "And I know you didn't intend to do this. I know that, Johnthony. I know you suffer every day. I know you do, and I'm sorry for that. I believe in God, and I believe in forgiveness. "But there are consequences when you're speeding and on the phone and there's kids on the bus." After the hearing, Brown said she'd received discovery in her civil suit against Walker's employer, Durham School Services, that showed Walker's bus generated hundreds of speeding alerts before the crash. Those alerts went straight to Durham, Brown said. A spokeswoman for Durham and its parent company, National Express, said Tuesday she could not get the necessary information together in time to comment. Chattanooga prosecutors said Walker was speeding and on his cellphone when he lost control of bus 366, swerved across Talley Road, overturned and crashed into a walnut tree. That's why District Attorney General Neal Pinkston said he wanted a prison sentence for Walker, who was convicted of a combination of lesser charges last month during a jury trial in Hamilton County. "We're talking about a narrow road with essentially no shoulder where there's a suggested speed limit of 25," Pinkston said. "Trial evidence said he was going 47 to 50 mph. That shows little to no regard for human life, especially when you have a school bus with 37 children in your care." To that end, Pinkston called Brown and a second mother, Jasmine Mateen, whose 6-year-old daughter, Zyaira, died in the crash, to the witness stand Tuesday. Mateen said she had two other children on the bus who survived. Still, her family is living through a nightmare. Last week, both her children were diagnosed with traumatic brain injuries, she said. And neither one of them feels comfortable riding the bus anymore. Mateen said she complained numerous times about Walker's speeding to the Hamilton County Department of Education before the crash, but Walker never got pulled off the route. She read a poem to Walker called "How do you live with yourself?" Misti Nash, whose 9-year-old daughter, Zoie, died in the crash, said she forgave Walker. She offered to stay in touch with him and said she hopes he gets help. "Yes, I lost a daughter," she said, "but you lost six kids, and you have to live with that."